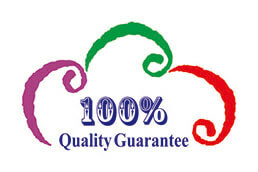 Buffer FormulationPBS, pH7.4, containing 1mM DTT, 5% Trehalose and Proclin300. Glucose and other reducing sugars can react non-enzymatically with the amino groups of proteins to form compounds called advanced glycation end products (AGEs). AGEs exert their cellular functions via the interaction with receptor for advanced glycation end products (RAGE). 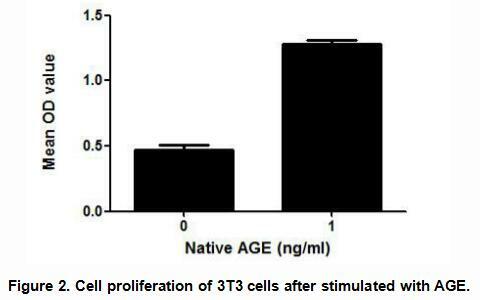 It has been reported that AGE stimulates the differentiation and proliferation of 3T3, thus a proliferation assay was conducted using 3T3 cells. Briefly, 3T3 cells were seeded into triplicate wells of 96-well plates at a density of 2,000 cells/well and allowed to attach overnight, then the medium was replaced with serum-free standard DMEM prior to the addition of various concentrations of AGE. After incubated for 48h, cells were observed by inverted microscope and cell proliferation was measured by Cell Counting Kit-8 (CCK-8). Briefly, 10µL of CCK-8 solution was added to each well of the plate, then the absorbance at 450nm was measured using a microplate reader after incubating the plate for 1-4 hours at 37°C. 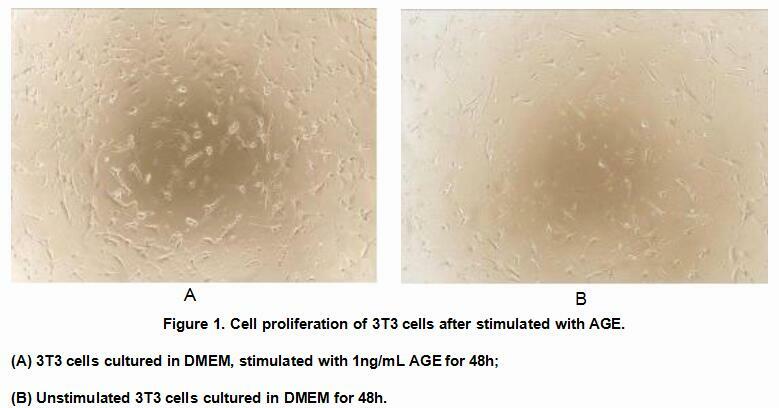 Proliferation of 3T3 cells after incubation with AGE for 48h observed by inverted microscope was shown in Figure1. Cell viability was assessed by CCK-8 (Cell Counting Kit-8 ) assay after incubation with recombinant AGE for 48h. The result was shown in Figure 2. It was obvious that AGE significantly increased cell viability of 3T3 cells. 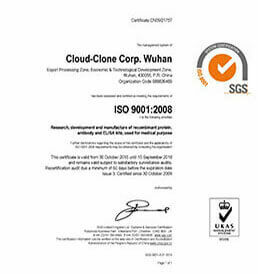 NPB353Ge01 Native Advanced Glycation End Product (AGE) Positive Control; Immunogen; SDS-PAGE; WB. 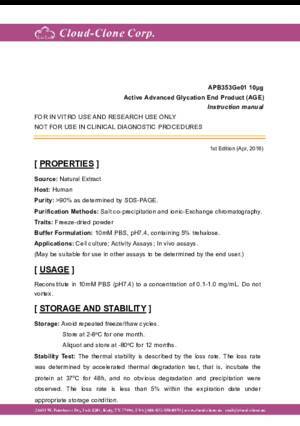 APB353Ge01 Active Advanced Glycation End Product (AGE) Cell culture; Activity Assays. PAB353Ge01 Polyclonal Antibody to Advanced Glycation End Product (AGE) WB; IHC; ICC; IP. LAB353Ge71 Biotin-Linked Polyclonal Antibody to Advanced Glycation End Product (AGE) WB; IHC; ICC. LAB353Ge81 FITC-Linked Polyclonal Antibody to Advanced Glycation End Product (AGE) WB; IHC; ICC; IF. MAB353Ge21 Monoclonal Antibody to Advanced Glycation End Product (AGE) WB; IHC; ICC; IP. HEB353Ge High Sensitive ELISA Kit for Advanced Glycation End Product (AGE) Enzyme-linked immunosorbent assay for Antigen Detection. 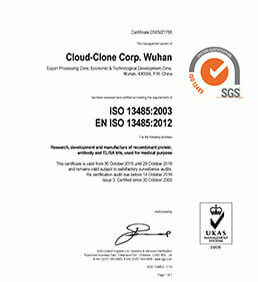 CEB353Ge ELISA Kit for Advanced Glycation End Product (AGE) Enzyme-linked immunosorbent assay for Antigen Detection. KSB353Ge11 ELISA Kit DIY Materials for Advanced Glycation End Product (AGE) Main materials for "Do It (ELISA Kit) Yourself".